It’s summer, which means families across the country are piling in their vehicles and hitting the highway. While we love a good old-fashioned road trip as much as the next person, traveling with kids means boredom will eventually sink in after several hours (or minutes?) in the car. 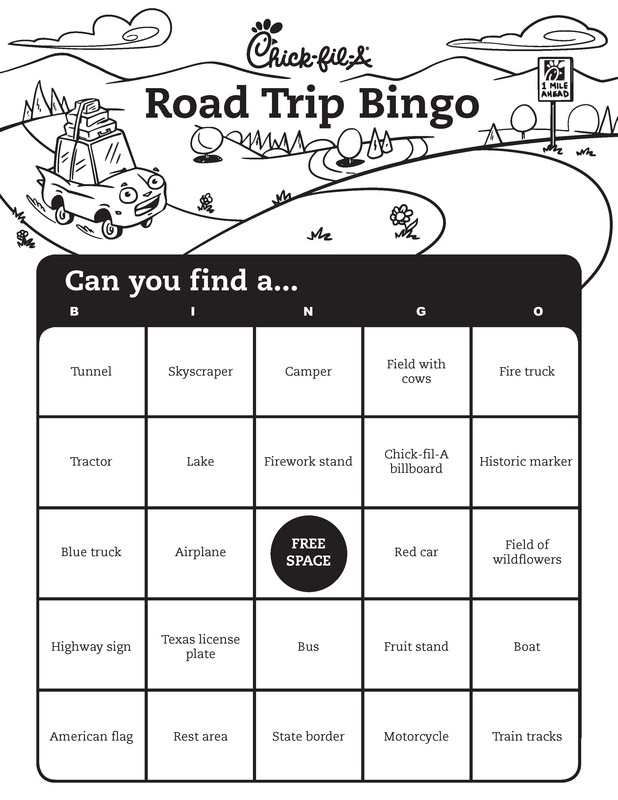 When even the best selection of snacks can’t entertain your restless passengers, pass the time with Road Trip Bingo. Easy to play and perfect for kids in the backseat, it will help postpone the inevitable “are we there yet?” on your next weekend getaway or family vacation. Click the link below to download and print your bingo boards. Each passenger should receive a different version of the board. While you’re on the road, each player will identify the items from his or her printout. When players spot an item from the board, they must announce it to the car. Each player with that item can circle the space on his or her board. The first player to circle five items in a row horizontally, vertically or diagonally and yell “BINGO!” wins. Click here to download your bingo boards. Enjoy! And if you’re looking for a pit stop along the way, you can download our Chick-fil-A One App to find and order from your nearest Chick-fil-A.